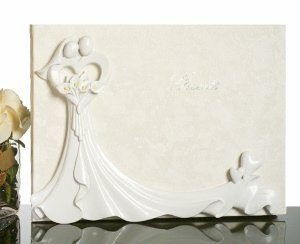 This beautiful 8" by 10" guest book is the perfect place to capture guests' names and addresses. 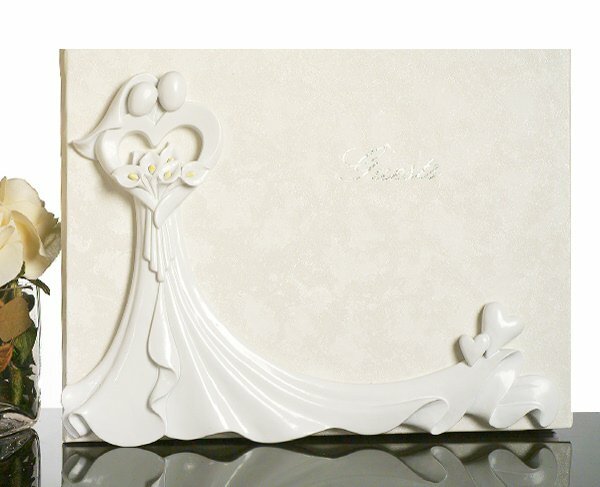 The 3-dimensional polyresin design on the cover will show your love and affection for each other with the gentle sweep of the bridal gown, the joined hands and the bride and groom's heads leaning into each other. The bride is holding a bouquet of Calla Lilies, and the yellow accent in the flowers brings a dramatic bit of color to the otherwise white piece. Matching reception pieces are available for this item, or purchase all the pieces together in our Calla Lily Bouquet Bridal Set.